Whether you’re looking to implement, upgrade, fix, or simply manage the wireless networks that help support and grow your business, Field Engineer can help. On-demand access to a global network of certified engineers with wireless expertise has never been so easy. Grow your flexible workforce by tapping into our global services. 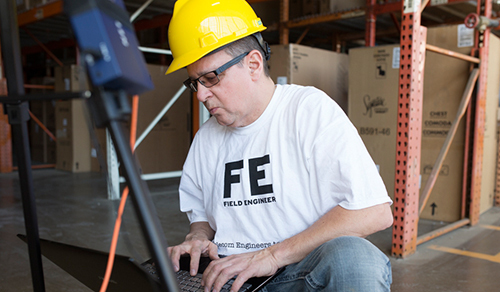 Field Engineer is a truly global service, allowing you to hire certified engineers from around the world to meet all your wireless needs. No job is too small or too big. To find your wireless engineers, sign up and start by posting your work order. You can outline not only the role you need to fill, but the individual tasks and skills required. Our global network of network certified engineers will start applying, allowing you to review your choices. Choose whoever has the skills, experience, and qualifications you need, and you can start working together immediately. On-demand access to your engineer of choice and the project management tool built by Field Engineer allows you to engage immediately with them whenever you need. You can track their progress throughout individual tasks, as well as the overall schedule which ensures you know that your wireless engineer is helping you stay on track. If you want access to a global, flexible workforce of highly-skilled certified engineers, Field Engineer is all you need. Sign up and post your work order today and we will start instantly connecting you with the most suitable applicants to help you meet all of your business’s wireless network needs.